For a long time, the place I wrote was in the marginof the family room. It was considerably distraction-prone by the TV and by life going on in general. And all this time we had this beautiful bay window, which basically served as a mancave. After reading an article in this month’s RWA magazine about having a writing space, I decided–before I even finished reading the article–that I had to ask my husband for the bay window. He, being the terrific guy he is, promptly cleared out for me. There is still the gun footlocker by the little wooden chair, but I am taking up the whole bay window, so this is enough, I think. And so I have the recliner, a small table for my lamp and my powerstrip, a small, elegant 1 drawer table (with a drawer that is just large enough for an office tray), an ottoman for the guest chair (and for my computer when I am not using it), and the guest chair. When I sat down tonight, I felt so refined and posh that I put in a Schubert quintet to listen to as I write. Something I never was able to do in the living room. Ahh … and now, I think I shall write. Aw, that’s so nice Tia. I need a writing space because I have been writing so little over the last year or so. I think I’m going to set aside a space in our spare bedroom because I’ll be a lot less distracted there. I hope you love your new space! Thanks! Have fun setting up yours! Lovely! We all expect great things now 🙂 I live alone, so I am able to use my dining room as my writing “office” and I do most of my actual writing sitting in the writing recliner (I swear, I tried out every single recliner in town to find one that fit me just right) in the living room. 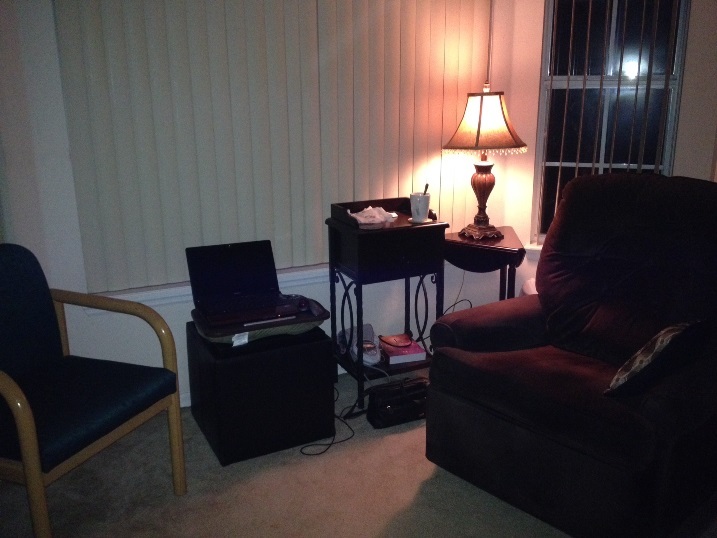 After all day at work, I am relieved to do my writing in a recliner. I need a better recliner. I got this one at the Sears Scratch-n-Dent outlet. It is reasonably comfortable, and has low arms (high arms wreak havoc on my shoulders), but the spring holding it open is so powerful that I have developed some great thigh/shin muscles from closing it.